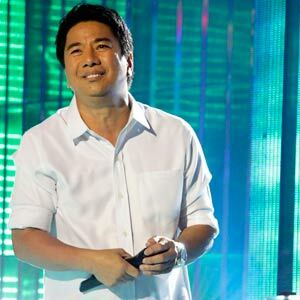 Wil Time Bigtime host Willie Revillame just made one less-fortunate Filipino happy by giving away P1 million pesos, a Foton van and a house and lot from Camella Homes last Thursday, May 26. "Joseph ’Nonoy’ Murillo could not help but burst into tears and sprawl himself on Wil Time Bigtime’s LED floor when host Willie Revillame announced that he answered the mega jackpot question correctly. "Ma, hindi ko alam ang sagot," Nonoy uttered in surprise while his mother tried to hold him up to accept his prizes, including P1 million cash, a Foton van and a house and lot from Camella Homes. "He sets the record as the first to win the mega jackpot last May 26 (Thursday), just 12 days after Wil Time Bigtime was launched last May 14. "’Ganyan kasimple ang buhay, dapat lumalaban gaya ni Nonoy,’ Willie told the audience after handing Nonoy a P1 million mock check (facsimile of a bank cheque). "The 20-year old gardener and service crew from Parañaque City is a fighter, indeed. Despite his age and lack of money, Nonoy was able to support his education while providing for his family at the same time. "’Mataas na ang edad ko pero sinikap ko pa rin po makatapos ng hayskul sa pamamagitan ng pagwo-working student,’ he said in an interview with TV5 newscast Aksyon. "Nonoy graduated from high school last March and is planning to pursue a college degree using a portion of money from his cash prize. He also plans to juggle work and school to support the education of his five siblings. "Earlier in the game, Nonoy was ecstatic after making it to the ’Wil Time Bigtime’ segment. ’Napakalaking karangalan po sa amin na makasama sa nag-iisang programang itong nagbibigay ng pag-asa sa’ming mahihirap,’ he said. "The people’s show continues to serve family-oriented entertainment with bits of inspiring stories for its millions of viewers every night (Monday to Friday) at 6:30 p.m. and on Saturdays at 5 p.m. only on TV5."